This story originally appeared in the Inland Valley Daily Bulletin in November 2011. The story of Chad Starling’s hockey career already had been written when his pickup truck pulled into the U.S.-Canadian border station at Sweetgrass, Montana early in the afternoon of Sept. 29. Starling played 503 games in the ECHL between 2000 and 2009, more than any ECHL defenseman during the decade. Last year, his third with the Reign, Starling was one of 12 players named to the league’s all-decade team. At 6-foot-6 and 205 pounds, the 31-year-old Starling looks like a typical hockey player, although his career trajectory was unusual. While his peers from the 1999 draft class either established themselves in the NHL or moved on to their post-playing careers, Starling slugged through one of the least glamorous jobs in professional sports: A low-scoring, defensive- minded defenseman in a league known for long bus rides, three-game weekend series and sub-$20,000 annual salaries. This was supposed to be Starling’s 11th season of professional hockey. It began just like any other, with a 400-mile drive south to the border from his home in Delisle, Saskatchewan. 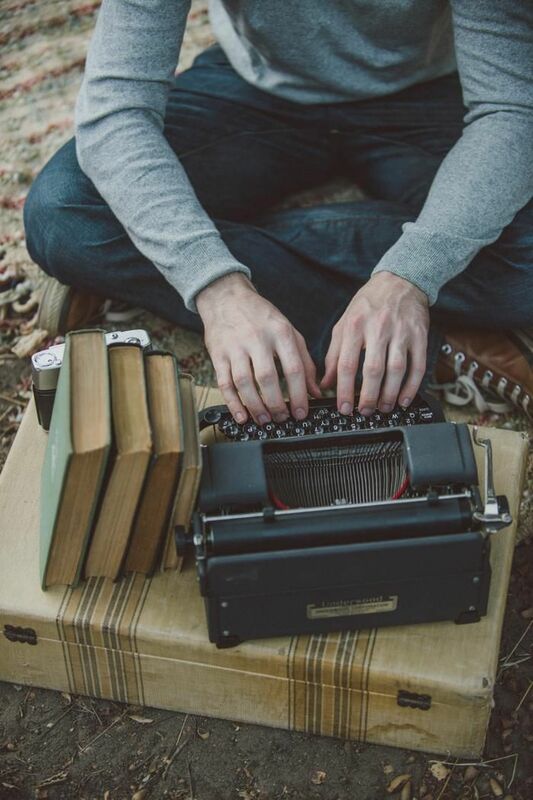 There, in Sweetgrass, a routine encounter threatened to re-write his legacy. When he was greeted by Customs and Border Protection Officer Andrew Hoggan, Starling had a truck full of hockey gear, some personal belongings and a printed letter with the official Ontario Reign logo on top. Hoggan read the brief note, which was signed by head coach Jason Christie. He went to a computer to verify the information by performing a Google search on Starling’s name. Hoggan was not made available for comment but Lynn Hurst, the public affairs liaison for the station, said this is a common practice. “If someone is claiming to be coming into the U.S. because of trying to get a visa for a sports visa or a work visa, and in order to substantiate their claim, they may Google that person’s name, or Google the team, or the business that they’re planning to work for,” Hurst said. What Hoggan found was a blog entry on this newspaper’s website, dated July 25, 2011, indicating Starling already had re-signed with the Reign for the 2011-12 season. (Google “Chad Starling” and the blog entry still is among the top results.) This presented a contradiction. The letter stated Starling was invited to participate in training camp, during which he “may engage in contract negotiations.” However, as a simple internet search revealed, a contract already had been negotiated and signed. To the government, that makes a big difference. Since Starling already “made” the team in the eyes of the government (in this case, a border guard), the B-1 visa wasn’t sufficient. Hoggan filled out the U.S. Department of Homeland Security form for Withdrawal of Application for Admission. That sounded simple enough. Ten days and Starling would be back in business. Camp was two weeks long, so this wasn’t a major setback. But why make it difficult? Why would the letter from the Reign request a B-1 visa when Starling needed a P-1? The answer is simple, but the logic is complicated. That’s why hockey teams at every level – the NHL, ECHL and CHL – pay an additional $1,225 Premium Processing Service fee. The P-1 then gets processed within 15 calendar days; if not, U.S. Citizenship and Immigration Services guarantees a refund. The Premium Processing Service can be applied to multiple P-1 petitions. So, for example, if a team has 10 players who need P-1 visas, the team can put all 10 names on a list and pay the $1,225 fee once. In the cost-conscious world of minor league sports, that means a lot. Hoffman said the Central Hockey League has a policy of filing the petitions, and paying the extra fee, for all its P-1 eligible players 15 days before training camp begins – typically on Sept. 15 – so that each P-1 is processed in time for camp. The league also keeps an immigration attorney, Christi Hufford, on retainer to monitor the immigration status of every player. The ECHL has a different policy. “It’s standard procedure for players crossing the border for camp to ask for a B-1,” said Joe Babik, the league’s Director of Communications. The Reign apparently were abiding when Starling handed over the letter in Sweetgrass. This policy allows ECHL teams to save money, in case a non-tryout player who needs a P-1 visa is deemed expendable during training camp and is released before playing in a game. It was this apparent contradiction of facts that got Starling turned around at the border. But this isn’t the reason he never made it to California. Sure enough, within 15 days after Starling was turned around at Sweetgrass, his P-1 visa petition was approved. But a lot can happen in 15 days. Four more defensemen whom the Reign signed in the offseason were unable to play. Adrian van de Mosselaer contracted mononucleosis. Jason Fredricks and Pat Bowen went down with knee injuries. Jordan Hill got a tryout with the Manchester Monarchs of the American Hockey League and earned a contract in training camp. Starling called Christie on the evening of Thursday, Oct. 13, one day before the Reign’s first regular-season game. Starling said he would call Christie back once he knew he could get the day off. He did. Christie didn’t answer. Starling left a message. The season began as scheduled as the Reign lost their first game and won their second. Starling was added to the opening-day roster and officially went on 7-day injured reserve. A classic game of phone tag played out behind the scenes. Out of necessity, Christie had been working the phones to find defensemen to replace Hill, van de Mosselaer, Fredricks and Bowen. By the time he did, one week into the season, Starling was eligible to come off injured reserve. Then another roadblock emerged: There was no more room for Starling in Ontario. The next day, Starling was released. Christie said it wasn’t easy. Starling still is in Delisle working for his family-owned business, “cleaning out septic tanks, car washes, any kind of waste basically,” in a rural nook of Saskatchewan. He is an unsigned free agent and is comfortable calling it a career. Starling said he has no hard feelings toward his teammates. He’s convinced the discrepancy between the letter he was given by the team, and the letter of the law, is the reason he’s still at home. So something needs to change. 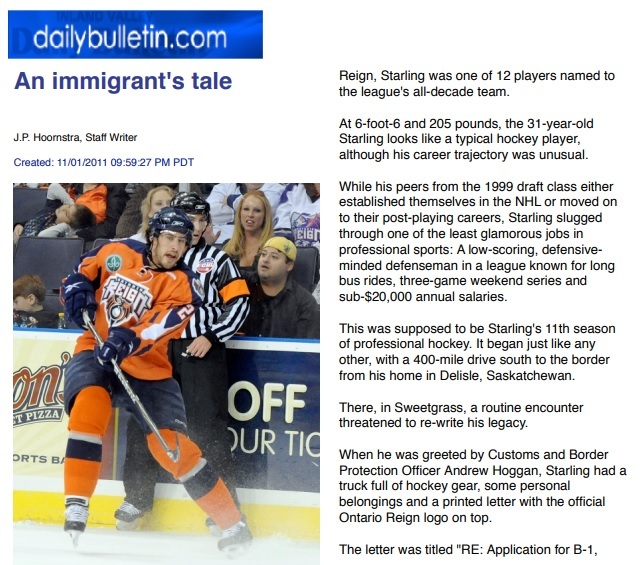 The ECHL can adopt an airtight immigration policy, maybe one similar to the CHL’s. Maybe the Department of Homeland Security can relax P-1 fees for minor-league sports teams who must pay the same amount as their major-league brethren. For now, his legacy remains only partially re-written. Protected: Tuesday, November 8, 2016.